Winter might be lingering on but most of us are dreaming of sunny spring days ahead. Fortunately, you no longer have to cling to those bulky, bundled layers and boots. Start taking your look from snow flurries to flowers with a few of our Stylists’ top picks for a seamless transition from winter to spring. Chunky sweaters. Great for topping off those spring dresses and blouses. Ankle booties. Not just for pairing with jeans! Boots look great with bare legs too. Tights. Still suffering from snow? Add tights to skirts and dresses to bridge the gap! Layerable basics. Since temperatures are still in flux, find a way to pair fresh spring pieces with winter-friendly staples. Statement jackets. Layering is the name of the game, so look to bold statement jackets to elevate your spring looks. Sure, we love our booties but making the change from these chunky winter staples to a feminine flat instantly nails a look that says, “I’m so ready for the spring.” And with options like ankle straps, romantic prints and chic pointed toes, there’s a style for every foot. Stylist Tip: Choose a pair in a bright and bold color that complements winter neutrals. Itching to finally wear a dress at the office, but not ready to bare your arms? Add a layer underneath with a crisp oxford button-down that gives your work look that’s got #girlboss written all over it. Need an extra layer? 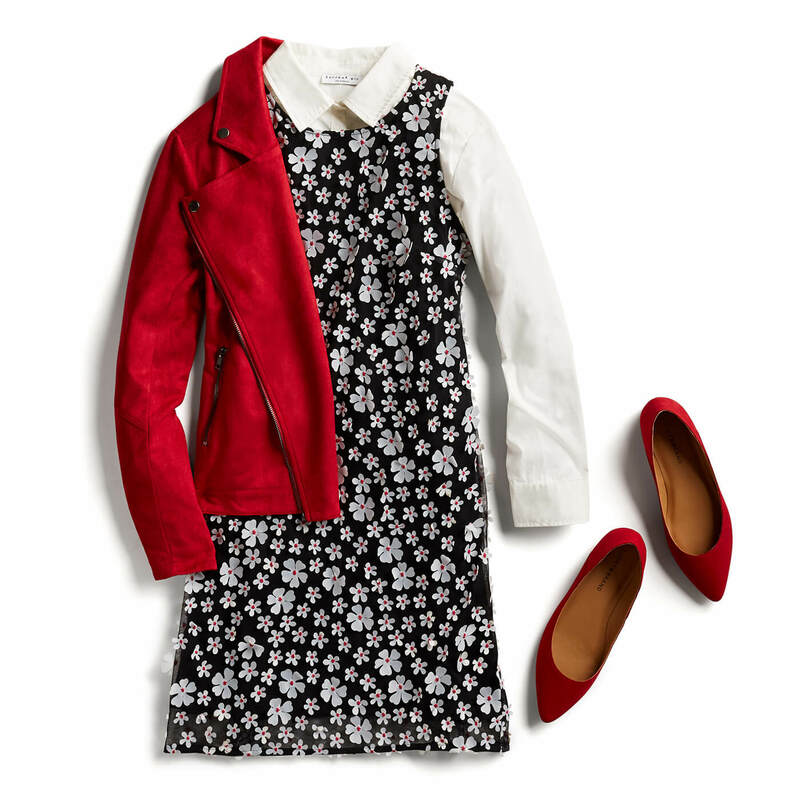 Just add tights. The moment the forecast shows an end to snow flurries, it’s time to swap out your heavy top coat for a lighter layer. Be trend-conscious with your lighter layer and reach for something in an updated style like a super-soft moto knit jacket for an instant update. While we’re on the topic, moto jackets are quickly becoming essential for every closet. Embrace this trend wholeheartedly and boldly pair it with literally any outfit your closet can conjure. Jeans and a tee? Yes! Pencil skirt and heels? Hello, office chic! Stylist Tip: With serious versatility, this is the kind of staple that’s worth the splurge so choose an investment style that’ll last you for years. Cozy cardigans are the perfect layering piece for a chilly workspace! 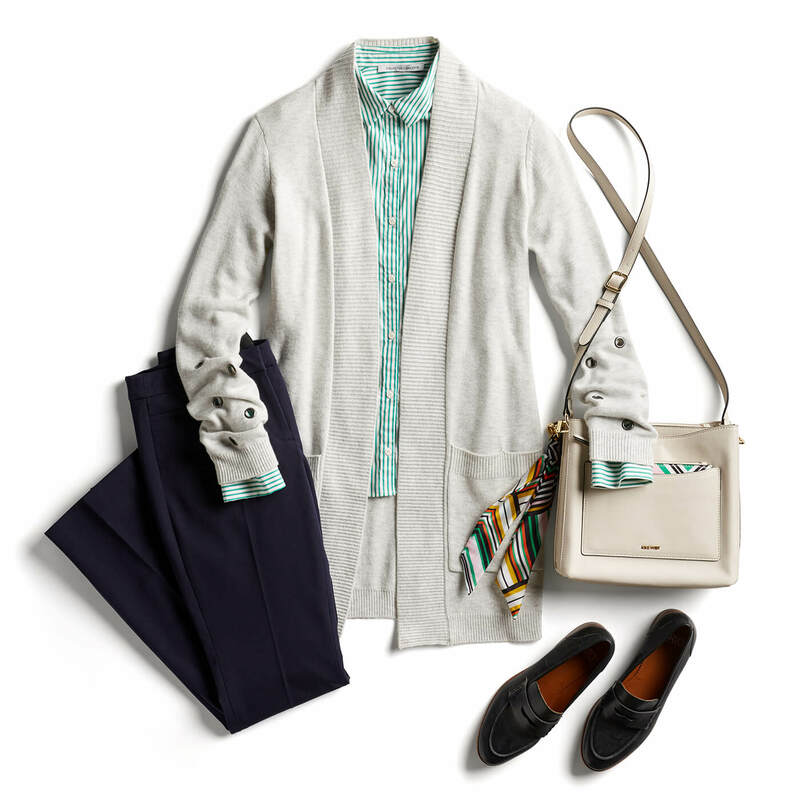 Pair your stretchy pull-on work pants (you know, the ones that almost feel like leggings) with a cheery button-up and your favorite winter cardigan for a look that strikes a balance between work-ready and comfortable while hinting to those bright spring vibes. Athleisure-lovers rejoice! Leggings are here to stay for another season. If you’re anything like us, you’ve had chunky, oversized sweaters and fleece-lined leggings on repeat since November. Now that spring is around the corner, it’s time to swap out thick knits for lighter-weight layers sure to accommodate the ebbs and flows of spring temps. Stylist Tip: Cope with fickle temperatures by opting for short sleeves or sleeveless tops under your lightweight layers so you can easily go from warm to cool on sun-drenched days. The transition from winter to spring means it’s time to tuck away puffer coats and snow boots and start reaching for jackets and flats again. Bid those dark hues farewell and fully embrace the rejuvenating colors and patterns of the season. We’ve got your spring style covered so head outside and start soaking up the sun! —Jennifer M. & Meagan A.